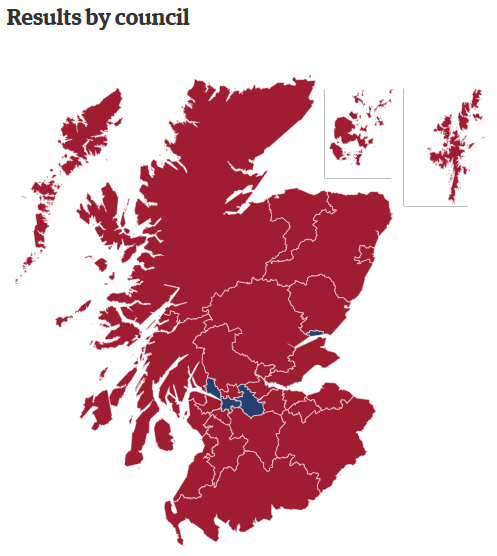 Last Thursday, 85% of the population of Scotland voted on whether Scotland should become and independent country. Today the results are revealed and represented online through various media outlets. Below is my review of how each site has done in terms of data representation. Pros: Clear, concise, informative. Cons: Slightly boring, could show more information on population. The yes/no nature of this vote makes the data quite easy to represent and allows for use of the sister to the pie-chart: the doughnut! Nice easy to understand and interactive visualisation. Unfortunately it makes the vote look far more “NO” than “YES”, but does allow for clear comparison of councils. Weighted bar charts of councils from the financial times: Pretty poor show from ft, their visualisations are usually much more interesting than this. However, a good use of populations of different councils. Difficult to quite compare how this effects the whole vote. 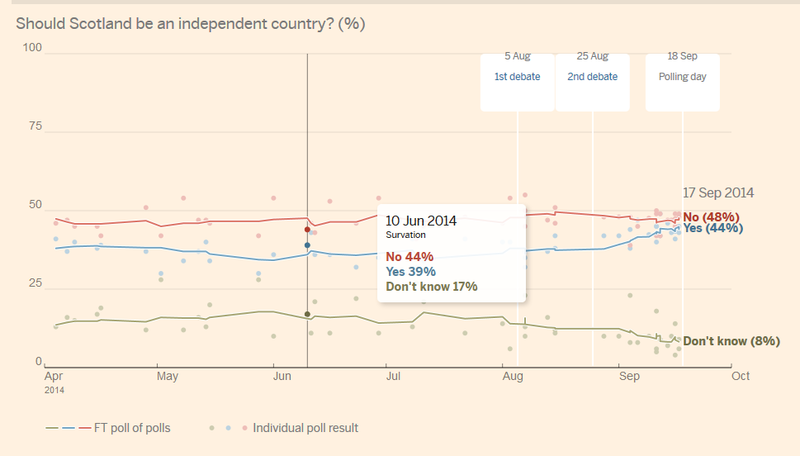 Interactive graph showing poll results of yes/no/undecided as the campaign has proceeded. This is more like it FT! good use of colour and lots of poll results neatly displayed. Allows for comparisons between different polls taken on the same date, overall comparison of how the campaign has changed the vote. Very interesting that they included the “undecided” vote in the mix as this has been one of the pivotal points of the campaign strategy on both sides. A nice interactive map from a researcher at the UCL department of geography. 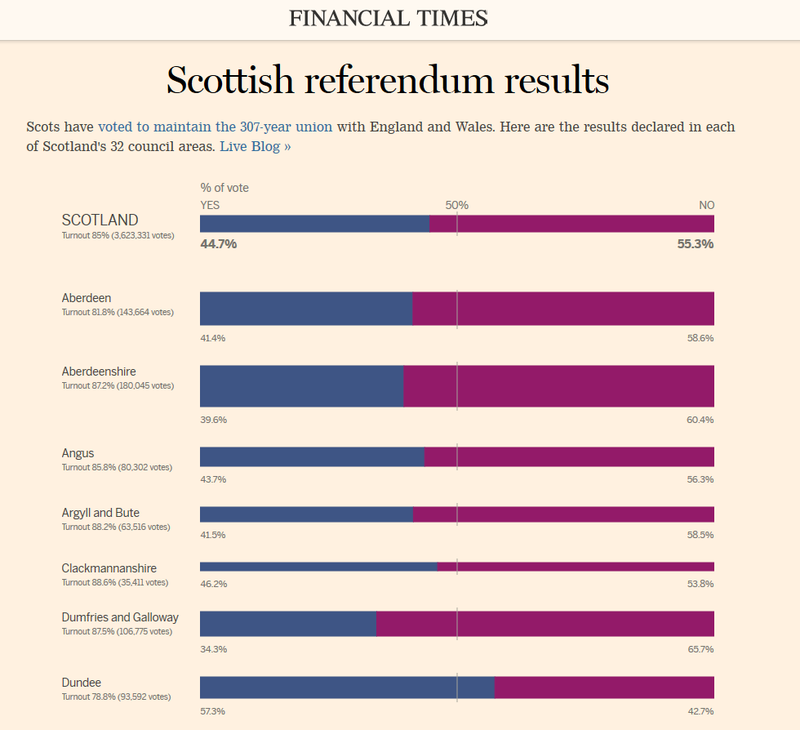 Good use of colours that show the yes/no vote in a better way than the Guardian visualisation. Excellent use of metrics (turnout % etc) in the bottom corner. Text is maybe a bit too large, but I’m picking holes really. The really fantastic thing is the display of the vote, the time at which the vote was collected and the previous SNP vote! A very interesting take on how the campaign has potentially effected the SNP vote. Another map and another take on the data. This time, showing how interested the rest of the world was in the debate. Nice use of size and colour for markers, with muted world map so as not to deter the reader from the point in hand.